The Paltalk interface is a 'one window' system by default, so everything stays in place and is easily accessible. The main window has several sections. These areas are used to control what you do while logged in. There are also 'alternative' view modes which will break the interface apart into separate windows, or use a more 'compact' way of displaying things, or both. This is the standard view, showing your Pals on the left, the global group listing on the right, navigation in the header, and your personal information on the top left. When you are in a group you will still see your Pals on the left, but the header and right side of the window change. 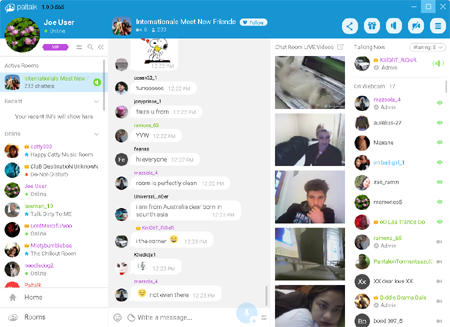 Now the header will show information about the group, the group's text chat in the center, and video viewer panels and participants on the right.